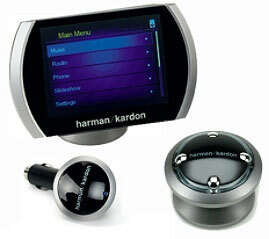 In the summer of 2006, with the help of Chad Perry, we did a video segment for the original Drive + Play from Harman Kardon. Almost 5,000 people watched that video on YouTube, not to mention those who received it via our Podcast iTunes feed. While I liked it a lot, and gave it a 4 out of 5 at the time, there were a few shortcomings with the device. No color screen and no support for the iTunes and iPod features added after version 4.7 of iTunes. (Such as reading the podcast directory on the iPod.) But the first version of the Drive + Play stayed in my car ever since, and was still, for me, the best solution for controlling the iPod in a car. 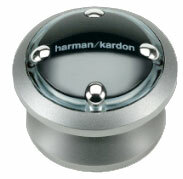 When I was setting up some appointments at Macworld Expo 2008, Harman Kardon was at the top of the list. I really wanted to check out the Drive + Play 2, which was advertised to have fixed or addressed the main problems I had with the first version. Rather than wait for me to check it out at the Expo, Harman Kardon shipped a unit to me the week before so I would have some actual hands-on time with the unit before talking with them. And am I glad they did! Let’s start with what the Drive + Play 2 does, and why I think it is one of the most elegant and practical solutions for iPod control in an automobile. To control an iPod while driving is not an easy thing. In fact, if there was one gripe I had with the iPod (and even more so with the iPod Touch and iPhone) it is that they are not easy to control by touch, that is, to select songs, playlists, or podcasts, without actually looking at the screen. CD’s were simple, you only had to click the Next or Previous button. But with a 12-track CD, there was not much to listen to anyway. The iPod, with thousands of songs and multiple user created playlists, the listener has many more options on what they want to hear, and how they want to hear it. So controlling and selecting the music is a huge strength for the iPod, but not when you are driving down the freeway at 70MPH. The Drive + Play 2 solves this problem by allowing you to both control the iPod by touch, via the wireless controller, and without looking away from the front window, via a 3.5″ color display. 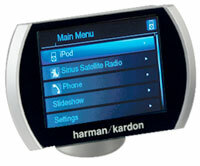 The Drive + Play 2 (heretofore the DP2), while not perfect, represents years of work by Harman Kardon, and it shows. They really seem to understand how an iPod user would want to interact with their music, and how controlling the iPod remotely should work. The media hub has a cigarette adapter on one end, and the actual media hub on the other. It is a small unit, so much better than the clunky and confusing media controller box of the first generation. The media hub is the hidden brains behind the entire unit. It interacts with the wireless controller and the color screen. It also has inputs to control music from a USB Flash Drive, other MP3 player, Sirius Satellite radio, and even has a Bluetooth adapter. The name Media Hub really does apply here. But for this review, I will focus solely on the iPod. The wireless controller, which requires a small watch-like battery to operate, is really what makes the DP2 work so well. With it, you can control virtually every aspect of your iPod music library. (Sorry, you cannot use the DP2 to play your iPod games, nor watch videos. Hey, you are supposed to be driving anyway!) You can select different playlists, or go for artists, or albums, or songs. It really is like using an iPod. Once nice feature is located on the default home page of the DP2: a “Shuffle Songs” option without having to drill down into the iPod settings itself. I use it often when not listening to podcasts. There is some concern on my part about how long the battery will last in the controller knob. I would hate to get into my car one cold morning to find a dead battery, and be unable to listen to my iPod. I have been using it for two months now, and the battery that shipped with the unit is still going strong. I have noticed that, on occasion, the control knob will not work until after the second button push when first plugging in my iPod. It is kind of annoying, but not a deal breaker for me. The DP2 is upgradeable via Firmware Updates, which is great. What is not so great is that the Firmware Update requires either XP or Vista to do so. Sure, I’m running both via VMWare Fusion on my iMac, but that will not be the case for many Macintosh users. Why Harman/Kardon does not support the Mac for such a simple feature is beyond me. I hope this is addressed soon. This is really made for the iPod, which will in all likelihood represent 98% of everyone buying the Drive+Play 2, and the company who makes the iPod is Apple. Yet they don’t support the Mac OS. Odd. The 3.5″ color screen is a vast improvement over the last generation greyscale screen. If you’re used to controlling an iPod, the screen will be a no-brainer for you. One nice feature is that album art is also displayed during a song, but the artwork can take a few seconds to display when clicking through songs. Also, I don’t know if the screen is simply low-res or if it is not displaying artwork correctly, but album art that looks fantastic on the iPod screen (or within iTunes) looks pixelated and ungainly on the DP2 screen. But that still beats the first generation Drive + Play by a long-shot. Another minor gripe, but one that becomes more and more apparent as time goes by, is that the DP2 takes a lot longer to boot up than one would think. The problem here is, if you are listening to a podcast or in the middle of a playlist, and you leave the iPod (or iPhone / iPod touch, it works well with both) connected, the DP2 forgets what was playing and you have to reselect it. A workaround is to simply unplug the iPod, and reconnect it once the DP2 has booted up again. It’s annoying, but I don’t know if the real problem is in the DP2 or the iPod. The DP2, I suspect. All in all, I’m very pleased with the DP2, its few shortcomings notwithstanding. As I said, it is the most elegant solution to controlling an iPod in your car. While there are some minor problems with the unit, I haven’t used another solution that is as compelling and intuitive as this.